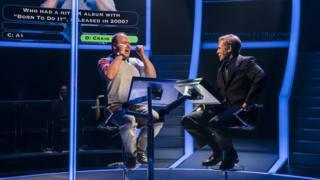 James Graham's latest play, Quiz, tells the story of what the playwright describes as the "most British crime of all time" - the Who Wants To Be A Millionaire coughing scandal of 2001.Charles Ingram, a former British Army major, was accused of cheating his way to the jackpot on the ITV show by conspiring with his wife, Diana, and another contestant, who would apparently cough when the correct answer was mentioned.Ingram maintained his innocence throughout his court trial. Now, West End audiences are (literally) being asked to decide for themselves whether or not he was guilty - by voting via a keypad at the end of both the first and second half. "I think quizzes and game shows are fascinating, they're a very British obsession and I love that," Graham tells BBC News. "But I think the story about whether or not a few middle class people tried to steal a million pounds with questions and coughing, feels like the most British crime of all time. And almost ludicrous in its simplicity. "It just felt really delicious to me, and I thought if we could just try and turn that into an Ocean's Eleven-style thriller, but with with a major and a Welshman coughing, that felt really exciting as a proposition. "Ingram was found guilty but did not go to jail - the judge instead gave him to a 20-month suspended prison sentence. "'Art is a lie that makes us realise truth,' says a character in the second half, quoting Picasso, but this heartless, undeniably enjoyable comedy seems to turn that statement on its head, which may, of course, be Graham's point. Despite my own reservations, I suspect this is going to be extremely popular. "Speaking to BBC News after the show's London premiere, director Daniel Evans says: "I'm feeling very relieved, because it was a nerve-wracking evening. "There were many challenges bringing it from Chichester, because the Minerva theatre is a 300-seater, whereas the Noel Coward is a 900-seater." Several changes have been made as a result, and the show is now more ambitious. "We put audience members on stage to replicate the studio conditions from the TV show," Evans says.Graham, meanwhile, estimates that around 40% of the play has been rewritten between its staging in Chichester and London. "Not because we weren't happy with what happened in Chichester, but you learn so much when you do a tryout for a show, so we streamlined the narrative, I reordered some of the structure, we had to think about a West End proscenium Victorian theatre, which is very different to a studio theatre in Chichester. "Also, so many people involved in Who Wants To Be A Millionaire came to see it, and they called me, asked to meet up, and I learned new stuff, new facts, new anecdotes, so it evolved because of that as well." Theatregoers are invited to vote via keypads on Ingram's guilt or innocence, both at the end of the first half (when the case for the prosecution is put forward), and the second (after his defence has been heard). It's a case of quite literally asking the audience.Evans advises: "Audiences should stay to the very end of the show, because we display some data about the last 10 performances, so people can compare the votes on the night they see the show, to previous ones, which is really interesting. "The results, of course, vary each night - but Evans and Graham both say that audiences generally vote guilty after hearing the prosecutors' case, but are more likely to take Ingram's side after hearing the defence.Presenter Chris Tarrant left little doubt about his own feelings towards Ingram this week, writing in The Daily Mail that he was "guilty as sin". Graham explains: "[Tarrant] came to see the show in Chichester. He came in disguise so we didn't know he was there. The actors knew when he was leaving because his driver was there. "Will Graham reveal his own thoughts on Ingram's guilt or innocence? "I wouldn't dare," he laughs.Several of Graham's plays - such as Ink, This House and Labour of Love - have been staged in London over the last two years, cementing his status as one of the industry's most prolific and sought-after current playwrights.In 2016, Graham revealed he was also working on a TV drama about Brexit - a project he now confirms should hit screens before the UK leaves the EU in March 2019. "There is a script, we have a director, we have a channel, we'll start shooting, we think, over the summer," he says. "And we've now focused it down. We now know that it's very much about the campaign behind the scenes, so we go behind the scenes of the Leave and the Remain offices. "We're very lucky to have source material from people like Tim Shipman of The Sunday Times, who wrote two books [on Brexit], and Craig Oliver, who was David Cameron's communications director [during the referendum]. "It's not necessarily an adaptation, but they're sources for us, they're consultants on the show, so hopefully it feels like an authentic behind-the-scenes [portrayal]." Quiz is playing now at London's Noel Coward Theatre.Follow us on Facebook, on Twitter @BBCNewsEnts, or on Instagram at bbcnewsents. If you have a story suggestion email entertainment.news@bbc.co.uk. » Jeremy Clarkson replaces Chris Tarrant on Who Wants To Be A Millionaire? » 7 days quiz: What was the most popular film in 2017?